The warm weather is finally here, and we are all living for it! Although it hasn't hit summer yet, these spring trends seem like they aren't going anywhere any time soon. From clothing to accessories to nails; there's a trend that would be perfect for you! Trendy Hair-Clips: I've have grown an obsession with these! Trendy hair-clips are some of my most favorite accessories. From catchy words to hashtags to smiley faces and hearts, you can glam up a simple outfit with this statement piece! Snakeskin: Whether its a long tight sleeve for a date night, a tank top for the club or a bikini for the beach, you know that snakeskin pattern will be available! Fashion Nova & Pretty Little Thing are some of the top retailers to have a variety of styles in this print for any outfit you have in mind. You can also spice up your look by switching it up to a neon snakeskin print! 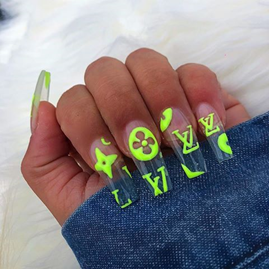 Neon Accent Nails: I'm sure these neon accents have taken over your social media timeline. 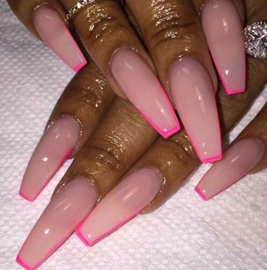 Famous IG nail tech @chaunlegend has started the infamous trend on some of our favorite celebrities like the Kardashians, Jessica Simpson, and Ella Mae. Add an edgy feel to your nails by using a different neon color on each nail or add some decals for a pop! Don't be afraid to try any one of these Spring/Summer trends this year. If you want to have some fun, be a daredevil and sport all three trends above at the same time! Stay tuned for more as summer approaches. Which one of these trends was your favorite?